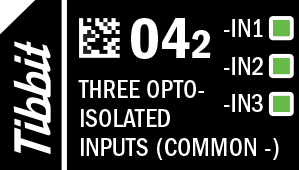 Function: Three optically isolated inputs with common (-). Inputs are fully isolated from system ground. If no external resistor is added these inputs activate at about 2V. Forward current should not exceed 10mA, and this caps the maximum input voltage at around 5V. Add external resistors if you need to apply higher input voltage. Combine this Tibbit with terminal block devices – #20 (nine terminal blocks) or #21 (four terminal blocks).